So what are the facts here? Should investors dump their portfolios immediately? For example, here is a similarly scary comparison between the same 1929-1930 graph and the U.S. stock market in the 2010 time frame. The author of this column noted numerous features of similarity, included instances of decline and rebound at various percentage levels, “shoulders,” “heads,” and a “rare double-digit right shoulder.” Needless to say, this “parallel” did not extend much beyond 17 Aug 2010, the date of the column where these graphs were shown. Whereas the DJIA declined during June 1930 by 22% (nearly to the November 1929 crash levels), it rose by 22% from Aug 2010 to May 2011. Not a very good prediction! This graph makes it appear that that S&P500 index is about to undergo a precipitous plunge (near the end of 2013), because its run-up seems to roughly coincide with the run-up of the Nasdaq index. 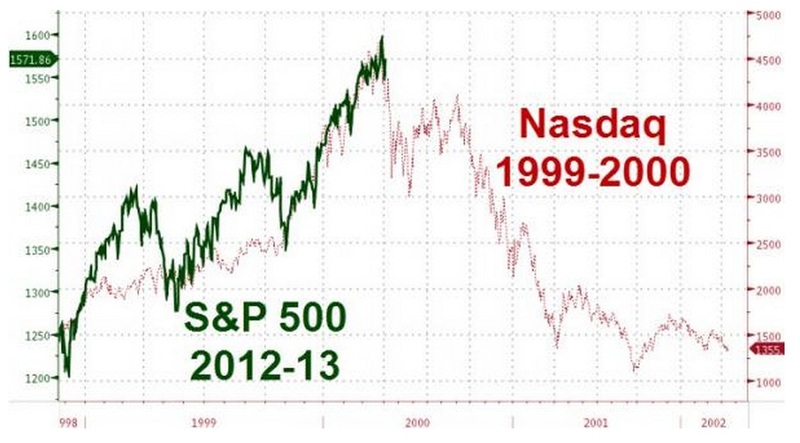 But, as noted in Brown’s column, the S&P500 graph has been scaled differently than the Nasdaq graph: whereas the S&P500 increased only from 1250 to 1600 during 2012-2013 (a 28% increase), the Nasdaq index increased from approximately 1600 to over 4750 (a 197%, nearly a factor of three) over the period in question (2 Nov 1998 through 1 Mar 2000).